Two down, only twelve more to go! Objectively for me (which I realize is a contradictory statement), this is a three star book. It has some major problems. But . . . I just can’t resist the siren call of an immersive fantasy world, and unlike the first book in the series, which failed to capture my imagination, this one did. So I’m giving it the fourth star, for the potential I see in the series, and for giving me that good old fantasy world buzz. 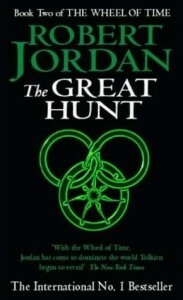 First, the good stuff, the most notable thing being that this book actually felt like it’s own thing, as opposed to The Eye of the World, which really felt like Jordan was stealing everything he thought he could possibly get away with from The Lord of the Rings. Rand al’Thor knows he is the Dragon Reborn, or rather, I should say, people have told him that he’s the Dragon Reborn, the dude who’s prophesied to save the world from the dark one in the last battle, but he’s resisting his fate with everything in his power, to the point of idiocy. All the while he’s resisting the urge to channel the one power, which will eventually make him go mad, he’s all But I’m just a shepherd! 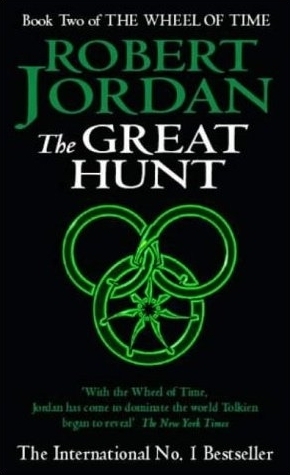 While he’s fighting this internal battle with himself, his outward life has changed beyond all recognition, and Moiraine, the Aes Sedai that brought him and his friends out of their home town and saved their lives last book, is determined to see him on his proper path, whether he likes it or not, going so far as to have all his peasant clothes burned, and supplying him with new ones fit for a lord. The whole book everyone around him thinks he’s a lord, and treats him like one, which causes a rift in his friendship with boyhood pals Mat and Perrin. Of course, Rand himself is also partially responsible for the rift because he’s an idiot, but more on that later. So with all that going on, the Horn of Valere, which they found in the Eye of the World at the end of the last book, has been stolen by Darkfriends, and their old frenemy Padan Fain (possessed by that evil a-hole Mordeth) has escaped from Shienar custody. So Rand, Perrin, and Mat, along with soldiers from Shienar, set out to get the horn back from Fain and the Darkfriends before they blow it themselves. The spirits the horn supposedly summons will fight for whoever sounds it, good or evil, and its imperative that the Horn be. Egwene and Nynaeve head in the opposite direction to be trained as Aes Sedai. Also, the armies of Artur Hawkwing seem to have returned from across the sea after a hundred years away and are causing all kinds of trouble. In a lot of ways, the actual events of the plot aren’t as important as the development the characters are going through, which is nice. Unfortunately, the book suffers in the character department as much as it succeeds. Rand’s overall arc of accepting his identity as the Dragon Reborn is a good one, but the scene by scene minutiae of it gets tiring because he is so frustratingly dumb about so many things. He does that thing I hate where he pushes his friends away with mean words “to protect them,” which is dumb enough to begin with, but then he spends almost the rest of the novel being butthurt that they’re mad at him for thinking he’s better than they are. He refuses to trust people (mostly Aes Sedai, and Moiraine specifically) who have proven themselves trustworthy. He doesn’t take the million hints he gets, including dreams from the enemy himself, and literally everyone telling him he’s an Aielman, or whatever else, of his new identity. He can’t even manage to spot a villain in his midst who is more than obviously trying to sway him to evil because she’s so pretty, even though everything she says and does screams out EVIL CHICK. Ironically, he trusts her immediately when she has nothing but harm in mind for him, but he won’t trust Moiraine at all, who has done nothing but help him and save his life. A lot of this is Jordan’s writing, I think, that’s the problem. He’s not great at subtlety. The idea of Selene is a good one, but if he wanted to make her a true honeypot, she shouldn’t have been so damn obvious about it! She’s known Rand for about ten minutes before she starts yammering on and on about him reaching for greatness, and oh why don’t you go this way, and oh why don’t you take the Horn? And when he doesn’t do what he wants she throws a temper tantrum and wanders off. Anyone with half a brain would have thought, gee, why is this random INCREDIBLY BEAUTIFUL woman so interested in me? He’s so adamant about being a shepherd, if he really thought he was, why would she care about him? The only way she would is if he was all the things he so very much resists being. It’s so frustrating. Pretty much all of the characters have their stupid moments, but especially Rand and Nynaeve, who seems to think Moiraine ruined her life and all her friends’ lives, with no basis in evidence for it at all. In fact, the exact opposite. If it weren’t for Moiraine, realistically, they’d probably all be long dead. I was feeling a little down on this book closer to the end as the characters kept being stupid, but the last fifty pages or so are pretty awesome, and I couldn’t help but enjoy myself while reading them. Here’s hoping we won’t have to deal with Rand being whiny about not being the Dragon anymore. Will hopefully pick up book three next month. Share the post "Two down, only twelve more to go!"